Exploration, expansion, and colonization had varying consequences for different peoples. How do conflicting ideas affect progress? What makes one culture seem more appealing than another? Geography extension/ mapping skills: Students create (3D model, online, or draw) the island, including natural resources found on it, geographic location in relation to other landmarks, location of settlement, etc. Develop rubrics to assess this project. Suggested evaluation branches: oral debate, policy proposal, realistic suggestions for compromise between two communities. Quiz evaluation: can be open book and based on big ideas/ essential questions (synthesis) rather than fact-based recall. Scaffold assessment with feedback on thesis statements, paragraph outlines, practice arguments. > Have students create map of the world during age of exploration to show specific information. E.g. natural resources, migration patterns, languages, etc. Develop rubric to assess research skills (quality of sources, bibliography), presentation skills, information found (accuracy, relevancy). Constant feedback from students and dialogue after each activity outlined in the Learning Events will help to direct and adapt what is explored in the next activity. Self, peer and teacher evaluation of the Performance Task and its alignment with the essential questions. ESSENTIAL QUESTION: How does scarcity and choice govern our economic decisions and the world around us? ESSENTIAL QUESTION: How do we determine what is valuable to us as individuals and a society? What is the value of money beyond its monetary worth? What economic opportunities and problems arise from changes in technology? ESSENTIAL QUESTION: What does it mean to be an educated consumer? ESSENTIAL QUESTION: Why do some societies choose one economic system over another for the economic well-being of their society? ESSENTIAL QUESTION: How are our common everyday decisions closely interconnected with how society, the environment and the economy functions? What does it mean to be an educated consumer? ESSENTIAL QUESTION: Why do some societies choose one economic system over another for the economic well-being of their society? How does scarcity and choice govern our economic decisions and the world around us? Students will outline a plan to make a forthcoming personal purchase within 12 months, allowing for timing, demand, and supply factors. Evidence of decision-making process required. Students will discuss why northern countries frequently tend to get ‘the best deal’ in trade negotiations. Discuss the wider implications of current trade events such as Brexit, TPP, NAFTA, or US / European protectionism. Discuss aspects of human psychology and explore why societies routinely hyper-consume, unlike other animals in nature. Examine the 7 Teachings that many Aboriginal communities embrace today. Include in the debate a third team who argues that Stanley Park must be returned to sole governance by its first inhabitants, the First Peoples. Discuss the concept that ‘economics is often politics’ and explore situations where public / private resource issues are often split down political lines. Hold a small-town municipal election where the sole issue is resource-based. Explore the advantages and disadvantages of extreme cases of public / private economies such as Northern Korea / Switzerland. There are many notable global business cases where corporate externalities have had far-reaching consequences. Students can extend this trial’s learning task to individual project research with each student (or pair of students) examining a separate, well-known multi-national corporation and its CSR record. In their create-an-economy group, students will locate and reproduce articles from a local and national news source that deals with immediate economic factors. They will visually display these articles in a graphic presentation and under each news item, will compose a one-paragraph analytical response to why the factor is ‘working’ or ‘not working’ for our present-day economy. 1. Assume the active role of a community member in the cornerstone task of taking part in a multi-month classroom economy simulation. 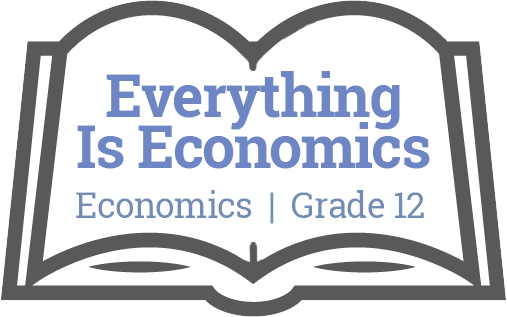 See The Classroom Economy under Resources for a useful link. 2. Self-assess a timely personal economic decision for Opportunity Costs, giving weight to present and future ramifications. 4. Interview a local Corporate Knight and present an evaluative summary of its business practices using a Corporate Social Responsibility filter. 6. Use collaborative inquiry to invent or improve a process to solve a current economic problem in the news (see #5 above). 7. Evaluate an unfamiliar economic system from multiple viewpoints, being aware of personal cultural bias.